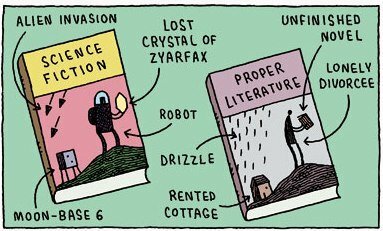 The phrases “genre fiction” and “literary fiction” strike fear into my heart. There’s a constant tug and pull in the literary world between what is of the higher art and what is considered beneath the establishment. What should be valued more? Entertainment and enjoyment or the more “artistic”, philosophical, cerebral side of literature. Being a graduate student studying creative writing, I cringe when people ask what I write. I am already anticipating the raised eyebrows and disapproving looks when I say, “Well, it’s technically science fiction or historical fiction.” Instantly, it is discounted as trope-laden, cliche genre fiction. One of the things I struggle with is explaining that it is possible for a book to be both literary fiction and genre fiction. As a point of reference before I go on, I will define the two types of fiction. Genre fiction tends to fall into a set genre (scifi, fantasy, romance, etc.) and focuses more on the plot than on the characters while literary fiction tends to lack a category and focuses more on the character than what happens in the story. The literary establishment seems to believe that these two factions of literature are mutually exclusive, but why can a book not focus on both character development and plot? When writing The Earl of Brass, I struggled to define exactly what it was. Of course, I focused on plot, I wanted it to be entertaining, but I also tried to focus on social issues and how it affected the well-being and mental state of my characters. There are steampunk elements, but it is still stuck in the middle between the Victorian novel and modern pieces. Maybe this is the problem. No one sees or wants to see the blurred line. Honestly, I chose to categorize my novel as science fiction and historical fiction instead of literary fiction is because it is easier for readers to find it. Would you pick up a random book not knowing what genre it is, especially if you are particular about what you read? Probably not, and literary fiction is not exactly descriptive. There comes the dilemma, do I cave to the status quo of the literary establishment or do I do what is best for my novel’s success? The choice is fairly obvious, so for now, I will brave the sneers and raised eyebrows. I just finished reading it. Very interesting and very true. I love that authors are also getting involved in blurring and dissolving this line. The dismissal of literature based on genre is preposterous and only a detriment to the reader.